Lying at the base of the Beartooth Mountains, you'll discover hospitality and style at Alpine Lodge. Enjoy the comfortable rooms, cable TV, kitchenett. Enjoy studio & 2-bdrm apartments (sleep 6) w/full kitchens, indoor pool, hot tub, wood fireplace & BBQ. Meeting room for 50, ideal for reunions & ski groups. Deluxe motel rooms and a handful of rustic cabins located in the heart of Cooke City, over Beartooth Pass from Red Lodge. Featuring kitchenettes, TV, wifi, and hot tub. Motel listings in our Red Lodge Lodging Guide. 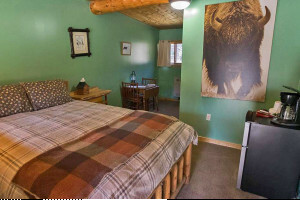 Book a motel room for your visit to the Black Hills in South Dakota.